This is an updated version of a What in the World article, in light of the March 5 announcement that Hugo Chavez has died. The original article was published here in January. 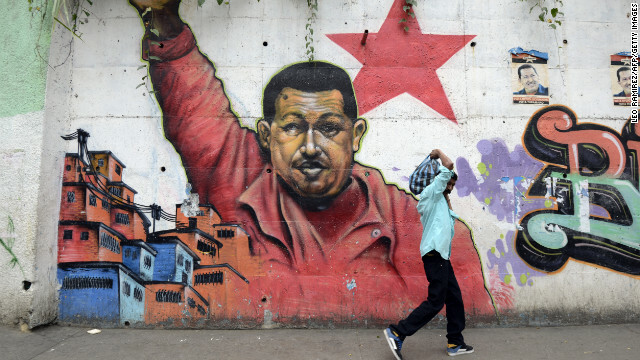 For 14 years, Hugo Chavez was a troubling global presence. He was an avowed critic of American capitalism…and yet he generated billions selling oil to the United States. He was a populist, whom some revered but others despised. One thing's for sure, Venezuela’s president was a fighter: last year it seemed he might even have defeated cancer. But the cancer returned, and when he couldn’t attend his own swearing-in ceremony, it sparked a natural set of questions in Venezuela and around the world: what's next? Whoever inherits the presidency, Chavez has cast a long shadow. Look at his record. On the one hand, the poorest are actually better off. According to the Center for Economic Policy and Research, poverty has declined by 50 percent since 2004. Extreme poverty has declined by 70 percent. Over the same period, college enrollment doubled, and millions of Venezuelans gained access to health care. Many are getting free housing – Chavez announced on public television last year he would build two million homes for the poor. But look deeper, and you’ll see that the programs that created these gains are built on the oil boom, badly designed, and damaging the Venezuelan economy. The economy is in shambles: Barclays Research puts Venezuela's annual fiscal deficit at nearly 20 percent of GDP, one of the highest imbalances in the world. Total debt has more than doubled since 2008. And that’s despite the fact that Venezuela has the greatest proven reserves of oil in the world – more than Saudi Arabia, Iran, or Canada. When Hugo Chavez first came to power in 1999, oil was trading at just $11 a barrel. Today, it is trading at about $90 a barrel. Chavez presided over the greatest windfall in his country's history. And yet Venezuela is probably the only petro-state in the world where people regularly suffer power outages. Infrastructure is crumbling. And public security is abysmal: Venezuela has one of the worst homicide rates in the world, worse even than Colombia, Honduras, or Mexico. A recent Foreign Affairs essay pointed out that Venezuelan exports to the U.S. from the start of Chavez's rule through 2011 added up to nearly $350 billion. That is ironic for a presidency that marketed itself as anti-American. But even that trend may be reversing. According to a Financial Times report, for every 10 barrels of crude that are exported to the United States, Venezuela now needs to import two back, because it lacks refining capacity, which has been made worse by a recent explosion at a Venezuelan refinery. In other words, America is selling oil to Venezuela! Meanwhile Chavez continues to ship a reported 100,000 barrels of subsidized crude to Cuba, everyday. Venezuela's people have gotten used to tall promises: free housing, essentially free gasoline. But increasingly, the state cannot afford it. It is popular to be anti-American, and yet the money has been coming from Washington. Cuba remains a staunch ally, but if it stops receiving cheap oil, it will pull out its tens of thousands of doctors from Venezuela, which will destroy Venezuela's healthcare system. All these years, a popular Hugo Chavez was able to mask all these fundamental flaws in his economy using oil wealth. But the problems are building. The next leader of Venezuela will face the buildup of all these problems, and probably without Chavez's charisma and guile. If you think balancing the budget in Washington is difficult, spare a thought for what Caracas will have to do in the coming years. Topics: Venezuela • What in the World? Democracy and Justice are just as safe under ex-bus driver Nicolas Maduro as they were under Chavez. State Attorney General Celia Flores guarantees that, because she happens to be Mrs. Nicolas Maduro. •	POVERTY FAMINE &Effected education. •	Increase every day by day OPEC. Economic save only 6 point. Peace, prayer, liberty, unity, friendly, and simplicity. And say, "Truth has come, and falsehood has departed. Indeed is falsehood, [by nature], ever bound to depart." Quran 17/81. Every one come Easy way Islam. Take of bath properly please say.ALLAA AKBAR VA ASHATHU ANNAMOHAMMED ABDUHU VA RASOOL. Following. 6. 1, each everything only believe ALLAA next 2, A DAY 6time prayer. 3, RAMADAN Every year one month fasting 4, ZAKKATH. Every year one time Charity 6% 5, IKRAAM. Give an take policy 6, DAWA call Every body Islam. According to the CNN WORLD report, in the war 6, 75,000 civilians killed, 7500 troops of USA and its allied forces killed 3 25 000 people wounded and $ 3.5 Trillion Dollar spent for the war. This spending of $ 3.5 Trillion Dollar is the main cause of action for the present economic crises prevailing all over the world. Then it is the bounded duty of the United States of America and its allied forces to withdraw from IRAQ.